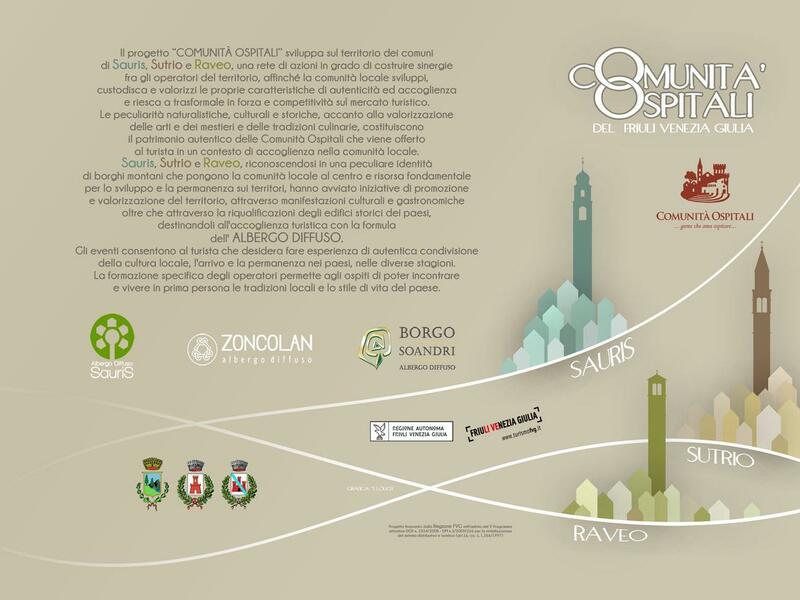 "Comunità Ospitali" (Hospitality Communities) is a project that involves the territories of the municipalities of Sauris, Sutrio and Raveo and includes a series of initiatives aimed at building synergies among local operators so that local communities can develop, preserve and enhance their characteristics of authenticity and hospitality and succeed in transforming them into points of strength and competitiveness in the tourism market. The naturalistic, cultural and historical features, the enhancement of the arts, crafts and culinary traditions constitute the authentic heritage of the Hospitality Communities, which is generously offered to tourists in a welcoming local context. Sauris, Sutrio and Raveo, recognising themselves in a peculiar identity of mountain villages, consider the local community as a fundamental resource for the development of the territory, through cultural and gastronomic events and the redevelopment of historical buildings, destined to tourist accommodation with the formula of the DISTRIBUTED HOTEL. The events and the operators allow the tourist to have an emotional experience, living the village life during different seasons, discovering the local culture, reliving old traditions and enjoying the authentic life style of the place.